On completion of construction work on the Residence, the final development of the Würzburg Court Garden was tackled during the rule of the Prince Bishop of Würzburg, Adam Friedrich von Seinsheim (reigned 1755-1779). 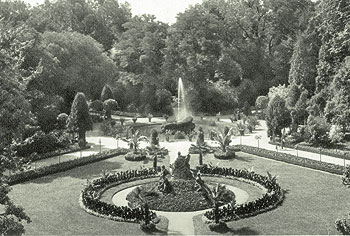 Seinsheim employed the Bohemian-born garden artist Johann Prokop Mayer (1735-1804) as new court gardener to help him in the realisation of the project. 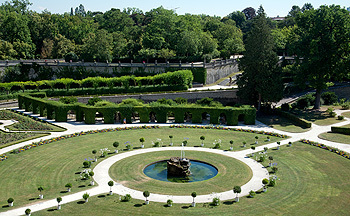 Mayer skilfully divides the awkwardly sized garden terrain rising steeply toward the bastions, into individual, symmetrical self-contained sections. 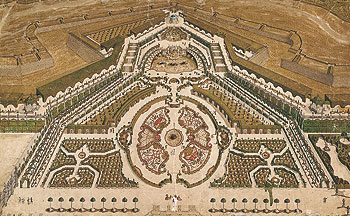 This resulted in the creation of approximately three equal sized parts, namely the East Garden, the South Garden and the nursery grounds. Mayer filled all sections of the gardens with an abundance of topiary fruit trees, hedges, trellises, potted plants and pergola walks. He developed the area referred to as the East Garden by extending the central mid-axis of the Residence. This commenced with a large circular broderie parterre. It was intended to build a cascade into the area rising up to the bastion behind. This was however never realised. In contrast to the East Garden, the South Garden lies on a plane area. 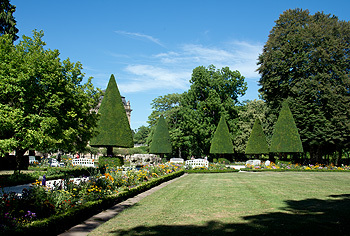 Today, this part of the gardens is characterised by eight large yews standing centrally around a circular water basin and trimmed to perfect cones. The decorative figures around the Court Garden originate from the workshop of the court sculptor Johann Peter Wagner. Famous are also the elaborate wrought-iron garden gates, manufactured in the workshop of the court metalworker Johann Georg Oegg. In the past few years, the flower borders of the East and South Gardens have been planted with inspiration from historical designs, and new fruit trees, which are to be cultivated according to old training methods, have been planted in the restored kitchen gardens below the orangery in 2001. A small 19th century landscape presents itself beyond the formal parts of the gardens towards the city.